Poor posture doesn’t just affect your appearance, it can hurt your performance, too. “When posture is comprised, you don’t breathe as easily, energy output decreases, and stress increases,” says Khalia Frazier, a group fitness intructor at Equinox Beverly Hills. If you have a long commute, spend hours sitting at a desk, or you're a habitual texter, a glimpse of your profile will likely reveal a slouch. Fortunately, you can use three techniques to reverse the problem: strengthening the upper back and rear deltoids, performing self-myofascial release (SMR), and stretching the pecs. The moves below address all of these components. Perform the first exercise at least twice a week as part of your regular resistance routine. The second and third moves can be done daily or as often as you’d like. 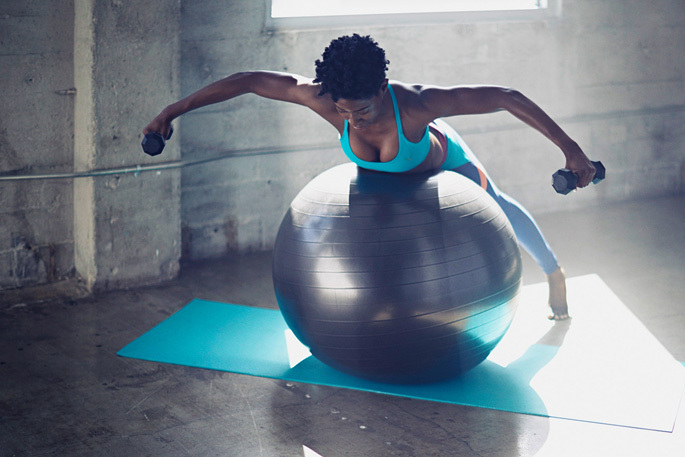 You’ll need a stability ball, a pair of dumbbells, and two therapy balls. Lie on back with arms extended overhead and two therapy balls beneath you, just above each shoulder blade. Lift hips into bridge position and extend arms out to your sides, forming a T. Shimmy shoulders from right to left. Hold a dumbbell in each hand and position your pelvis on the stability ball. Press your body against the ball with straight legs (wider than shoulder-width apart) and toes grounded in floor. Start with palms facing inward in first position, elbows slightly bent. Activate back muscles to open arms out to your sides (as shown). Head and neck should remain neutral with your gaze facing the floor throughout the exercise. Do 2 to 3 sets of 8 to 10 reps or until fatigue sets in. Stand facing a wall, raise right arm straight out to side, and place right palm on the wall. Rotate your body to the left until you feel a stretch in your right shoulder and chest. (You can move your arm at different angles to target different areas of the chest and shoulders.) Hold for 6 to 8 breaths.